From the land of Dirks Nowitzki and Bauermann – David Hein reports on a few happenings in Germany’s top division of basketball as the league gets set to close the regular season and start the playoffs. Read on to find out about Brose Baskets Bamberg laying down the law against Alba Berlin, the Artland Dragons-Bayern München playoff showdown, and how things are suddenly up in the air for the Fraport Skyliners. Brose Baskets Bamberg once again answered the bell with a knockout as the two-time reigning German Beko BBL champions knocked off Alba Berlin 100-90 in a game that was only a matter of pride for Bamberg, who had long clinched the home court advantage throughout the playoffs. P.J. Tucker continued his incredible play for Bamberg with 24 points, eight rebounds, four assists, three steals and one block while shooting 8-of-9 from the field, including 3-of-4 from long range. In the last five games, Tucker is averaging 22 points, 9.2 rebounds, 2.4 assists, 1.6 steals and 0.8 blocks while shooting 61 percent overall from the field, including 45 percent from long range and 82 percent from the free throw stripe. Tibor Pleiß had a superb game as well with 19 points, six rebounds, two assists and one block for Bamberg, who have won 22 of their last 24 games in the league and bounced back from their loss the previous weekend at Bayern Munich. “We had a lot of respect for Berlin. I am satisfied with how we went about the game. We passed the ball really well today [23 assists]. It was a successful comeback after the game against Munich. Tibor Pleiß deserves special praise. He had a great game,” said Bamberg coach Chris Fleming, who travelled to the Spanish island of Mallorca on April 23 for four days to prepare for the final regular season game and the playoffs, which tip off on May 3. “We desperately need some relaxation and a change of scenery. And you can really recharge your battery in the sun,” said Fleming. Berlin got 24 points from Derrick Allen and 19 from Kyle Weaver, but it was not enough as Berlin could not come up with the big stops defensively when they needed them. The loss for Berlin likely means they will finish as the third seed as they trail Ratiopharm ulm by one game for third place. Berlin host New Yorker Phantoms Braunschweig in their final game of the regular season while Ulm have a tough home contest against s.Oliver Baskets. Should Alba win and Ulm lose, then Berlin would be the second seed. The third seed will play against s.Oliver Baskets, who are secured in the sixth seed. The first quarterfinal best-of-five playoff pairing is set as Artland Dragons beat Eisbären Bremerhaven 91-76 to secure fourth place and the home-court advantage against promoted powers Bayern Munich. “I am very happy about this victory and securing home court in the playoffs. It’s a huge success for us that we once again are one of the top four teams in the Beko BBL,” said Artland coach Stefan Koch. The other playoff pairings will be decided this weekend, including the final two spots in the post-season. Braunschweig took the inside track on the no. 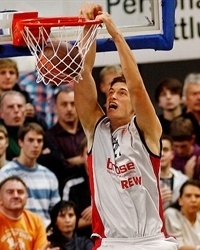 7 spot by topping Telekom Baskets Bonn, 83-74, in a makeup game yesterday. The Phantoms now boast an 18-15 record – including two wins against Bonn – while the loss dropped Bonn to 17-16. Two of the trio of Braunschweig, Bonn and Fraport Skyliners will make the playoffs with Frankfurt currently tied for eighth place with a 17-16 record. The Skyliners were one of the hottest teams in the league with victories over Bayern, Bamberg, Artland and Ulm since mid-February. But Muli Katzurin’s team lost at home to relegated side BG Göttingen in mid-March and then last weekend at home to Walter Tigers Tübingen in overtime. Braunschweig now travels to the German capital to take on Alba Berlin while Bonn host Skyliners in a thrilling finish to the season. The Skyliners lost the first matchup at home against Bonn by 15 points but have beaten Braunschweig twice this season. But it’s not just the playoffs that are thrilling: The fight against relegation is also worth a watch. Göttingen have already been dropped to the second division, but TBB Trier, EnBW Ludwigsburg and Phoenix Hagen all have 10-23 records while LTi Giessen 46ers are in the red zone with a 9-24 record. And the final game day promises a real highlight, as Hagen welcome Giessen in a game which will be shown live on German television sports station Sport1. Trier meanwhile have lost six straight and host Göttingen and Ludwigsburg travel to EWE Baskets Oldenburg. But both Trier and Ludwigsburg are secured a spot in the BBL next season – even in the case of a four-way tie at 10-24 – with a Giessen win over Hagen and losses by Trier and Ludwigsburg. So, it’s all down to Hagen versus Giessen – the winner stays in the league, the loser falls to the ProA second division.